The original study, published in the Proceedings of the National Academy of Sciences in February 2018, reviewed Environmental Protection Agency (EPA) data from 1982 to 2015 and found that private ownership of a water system was “significantly associated with higher compliance.” The dataset included the compliance records of 17,900 community water systems from across the continental United States. A further analysis of the dataset was conducted by Dr. Justin Adams of Encina Advisors, an economics research and statistical analysis consultancy based in California. 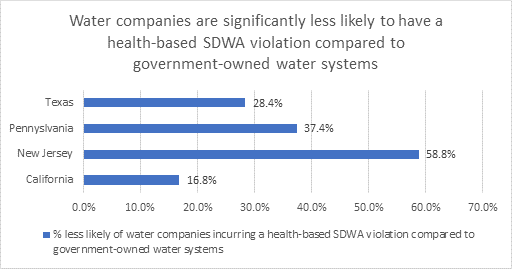 The finding that water companies have higher rates of SDWA compliance was evident both nationally and in each of the four states analyzed: California, Texas, Pennsylvania, and New Jersey. This marks the first time a state-level analysis comparing drinking water compliance records of regulated water companies and local governments has been conducted using this dataset. The National Association of Water Companies (NAWC) represents regulated water and wastewater companies, as well as ones engaging in partnerships with municipal utilities. NAWC members provide 73 million Americans with safe and reliable water service every day and have an exceptional record of compliance with federal and state health and environmental regulations. Ensuring this high standard of quality requires extraordinary amounts of capital investment. NAWC estimates that its six largest members alone are collectively investing $2.7 billion each year in their water and wastewater systems. For more information, visit NAWC.org.